I first took an interest in genealogy around 1989. My interest grew, as did my very badly kept scraps of notes. During the following decade, a number of computer databases designed for genealogy came onto the market, but I could only afford a used 8 bit Amstrad computer, and merely had to do with typing it all up on Locoscript word processor. In 1998, I finally moved onto a Windows 3.1 PC. I soon came across an early version of Family Tree Maker - perhaps version 3 or 4. I had to install it using a pile of floppy disks! I then used FTM to compile my family tree, complete with scanned photos. I could use it to print trees, albeit only on A4 sheets. I do wish that I had been more careful to conserve and record all of my sources back then. I wasn't a very methodical researcher. 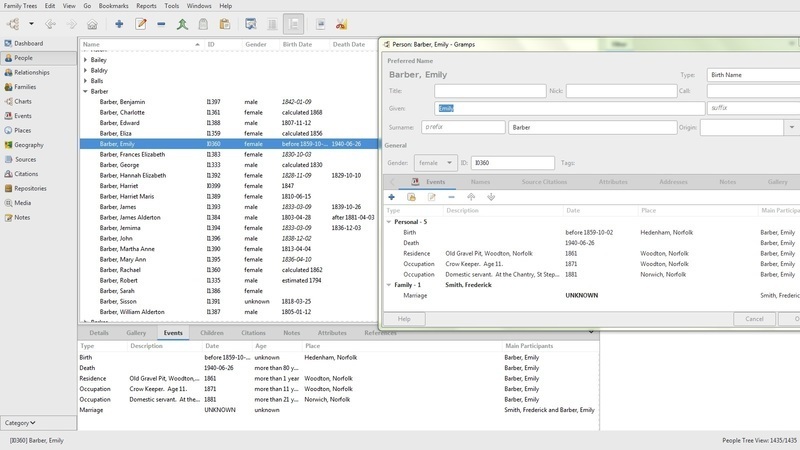 The program also allowed me to produce a GEDCOM file, which I could use on other genealogical databases, or, it promised, to share online, as soon as I had the ability to connect to this new Internet thingy. I indeed upgraded to a Windows 98SE PC, and even, with a 56k modem, connected to the Internet. I think that I bought a newer CD-ROM version of FTM. One of my first actions on the Internet was to upload my .ged (GEDCOM) file. I'm not too sure to who, what server, or what they did with my data. I wasn't too wise about the commercialisation of the information super highway at that time. It may have ended up with Ancestry.com enterprise, who no doubt have sold and resold it on. Eventually my interest in genealogy drifted away. Quake 3 Arena was much more fun than typing in ancestors to a database. I did at some point around 2006, upload my gedcom to a web server, so that it could be downloaded from my own ancestry pages. I eventually gave up that subscription. Life moved on. I went through family break up. Lost all of my old poorly kept notes, my hard drives, everything. Then a few months ago, I randomly decided to take a DNA test with 23andme. My interest in my roots rekindled by the prospect of genetic ancestral profiling, I dug up my old ancestry pages from a web archive service, and was surprised to find that they had also archived my gedcom file. I downloaded it. Now I needed some software in order to open it. I always look first for Open Source software. I found Gramps 4.2. Gramps is available free, and Open Source on both Windows and on Linux. It may be available for other platforms as well, I don't know. I've installed Gramps 4.2 onto my Windows 7 64 bit PC. I've also installed Gramps 4.0 onto my Lubuntu 14.04 (Linux) netbook. The screenshots that I've uploaded to this post, were taken on the Windows PC. There are differences between my two versions on two platforms, and I won't go into all of those. I'm mainly interested in updating and generating .ged GEDCOM files, bearing in mind, my past experiences in losing data over the years. 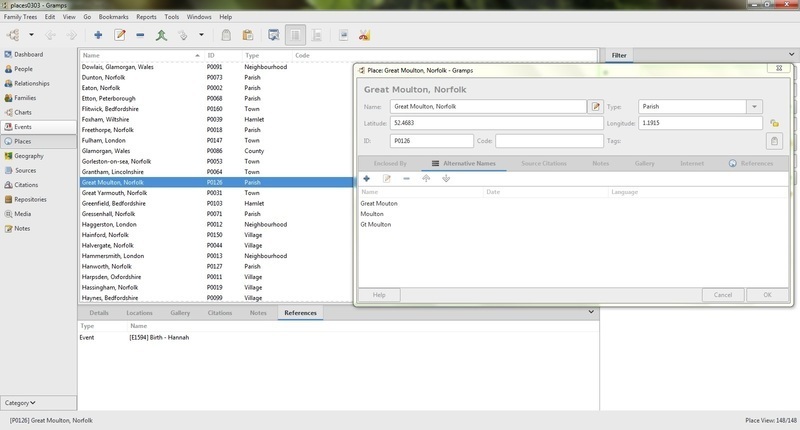 As long as I don't faff around too much on attributes carried by Gramps native features, that are not carried over by the GEDCOM format, the programs both run great. I haven't yet played too much with images. My understanding is, that you need to host the binary files in folders on your hard drive - then GRAMPS merely points / looks at them. That isn't something (as I presently understand) that is supported under GEDCOM. Gramps is a database. Like any database, it revolves around objects, attributes, and tags. Some glossy family history software might dumb all of this down a bit. They want to catch the mass market. Gramps does not shy away though. It's real magic is that it offers so many different ways of entering data, in ways that can be tracked to resources, citations, notes, places, even coordinates. 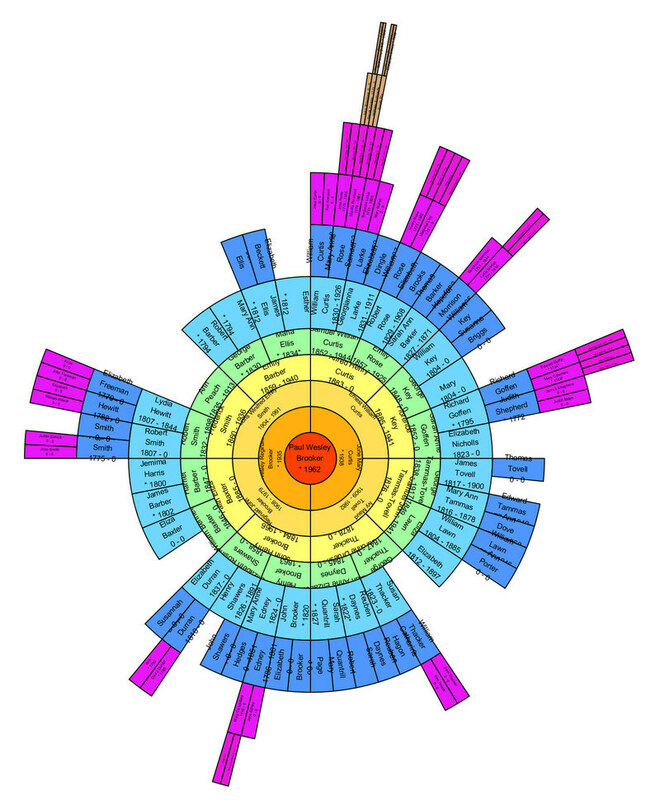 It's a piece of free software that the geek genealogist should love. Typical of Open Source, it is more functional than pretty. It's a piece of software that can be daunting at first. However, if you are methodical, and reasonably pooter-literate, give it a little perseverance, and you soon start to love it. It's features will encourage tidiness and well documented research. Why spend out on EULA licensed software? This week, I've been investigating the Places objects. I've discovered that you can geo-tag your places - that can be referenced to events, such as baptisms, deaths, census records, etc. 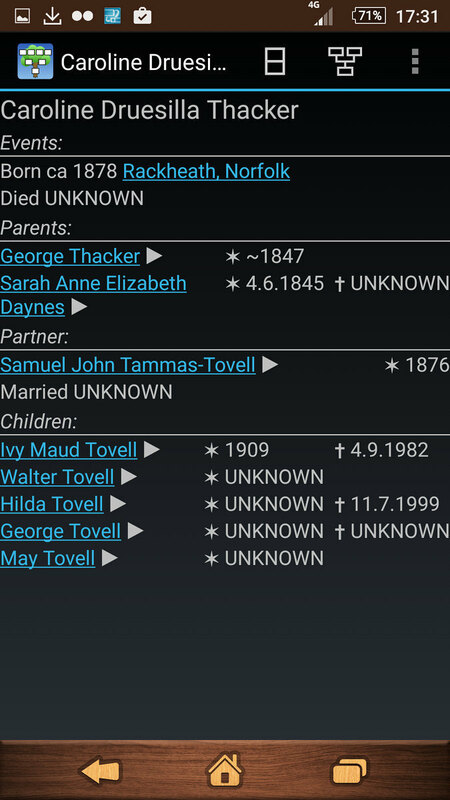 I must have hundreds of places for my family database of 1,435 ancestors / relations. None-the-less, I've been spending too much time on the pooter, tidying up my place data, and by referring to OpenStreetMap.org, copy and pasting longitudes and latitudes into all of them, along with place-type, alternative names, etc. It's all about making a better GEDCOM, a better family history database. I can see at least one error there - in the sea off the Kent coast. Some more tidying to do. By the way - the mapped events include the paper ancestors on my kid's family tree, including those of my Ex. Alternatively, I can browse the places, hit an option, and in a browser, up pops the location on OpenStreetMaps! There are many more features to explore on Gramps. I'll get to them in time. I've uploaded several of the fancharts that it can generate already on this blog. There are a range of other reports that it can produce, and web pages. The generated website is incredibly functional. It took a couple of minutes to generate pages for every one of my 1,435 family tree individuals. All with trees galore. All that I would need is a web host. As for stability. I've seen someone complain that it slows down. Nonsense. It's fine even with my extensive database. My Windows version is very slow to launch though - not so the Linux version. However, when it's up, even on Windows,, it is perfectly functional and very fast. Some people are also confused on how to load a GEDCOM file at start. I was. It's simple. You need to first create a blank family tree file from the manager. 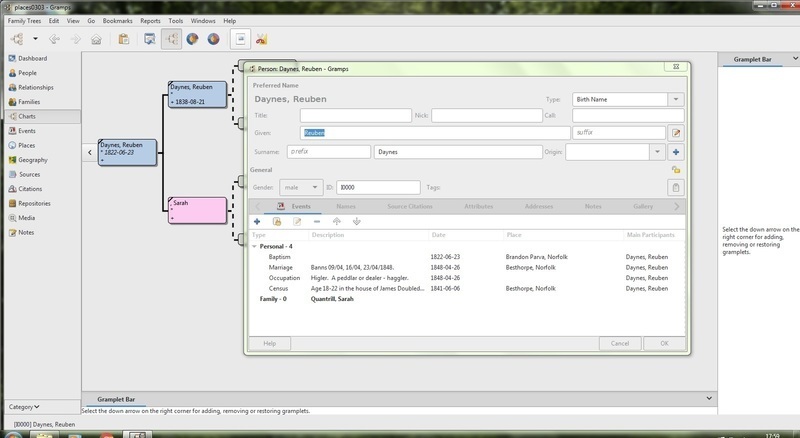 Then you can import your GEDCOM into it. You don't see the Import/Export functions until you have first loaded a family tree - just make it a new blank file. Once you have created a family tree, and imported a GEDCOM - be careful to use that file next time, and not do as I did - import the GEDCOM again. You'll end up with two of each individuals. Always back up before and after making any edits. I like to mail a backup to myself on webmail, so that the GEDCOM is also backed up on two webmail servers. 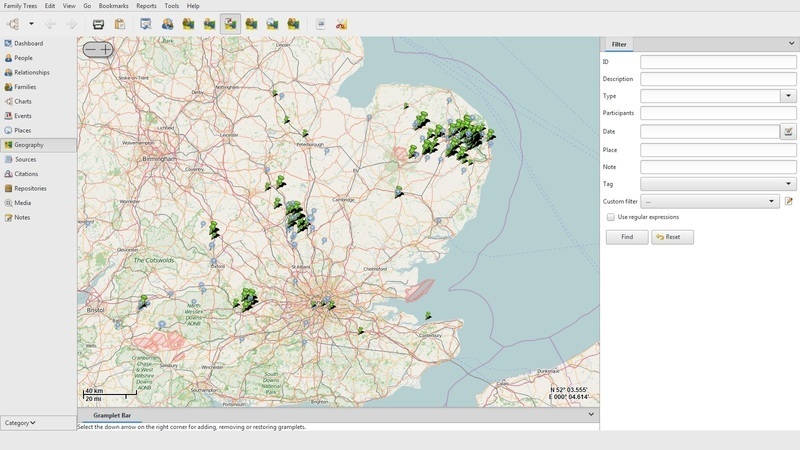 That geo data that I produced on Gramps, is carried over on GEDCOM to other databases and platforms. I use the GEDexplorer v1.24 ap on my Android smartphone. This app allows me to view my GEDCOM files on my phone! It cost me a couple of quid from the Play Store, but it was money well spent. 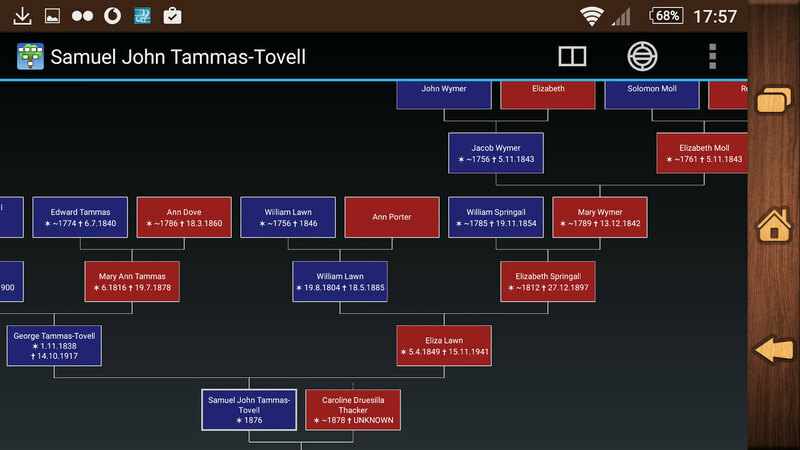 The above screenshot shows a view of one part of my tree - the ancestors of my great grandfather Sam. 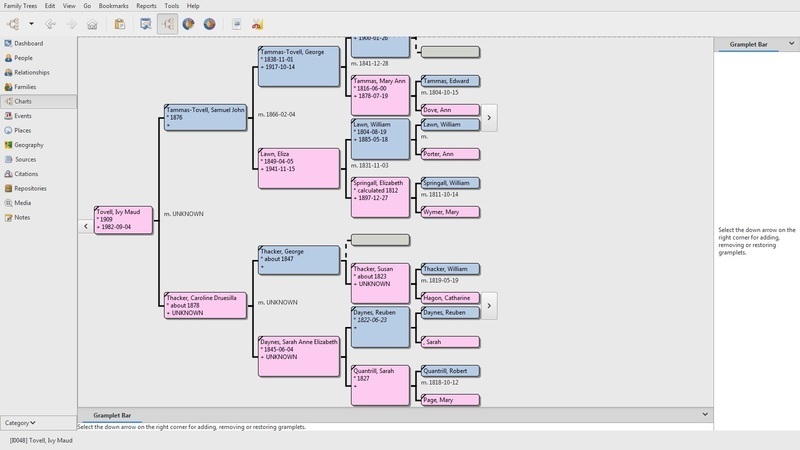 It's a really nice feature of GEDCOM files and this software, that you can open up your database, look through trees, fan charts, or just the data itself, browsing through ancestors. Handy if you just get a spare hour here or there to research with - but no lap top! Easy quick reference of your entire database from a phone. You see, it's all there. The beauty of GEDCOM format has reached from my Windows 3.1 machine, to my Sony Z3 phone. That's a rugged file format. and I can hit the link and look at it in more detail using Google Maps. Hell, I could even navigate to the actual place. My direct ancestry fan chart looked a little bit too uneven (the above chart is the improved chart, after the following research). I had compiled no ancestry for one of my great grandparents - my father's maternal grandmother, Emily Smith (nee Barber). All that I knew of her origin, was that although she married and settled with my great grandfather, in Norwich, that she was born in 1859 in the South Norfolk village of Hedenham. For some reason, perhaps a lack of resources back then (I conducted most of my family history 20 - 15 years ago pre-Internet), I had never traced any further back on her line. My Ancestry Fan Chart highlighted this Gap of data. I haven't really got the time to travel over to Norfolk Record Office at the moment, but I did have the recent opportunity to spend several hours online. Internet Genealogy can be a bit pricey though. Someone has to gain access to records, digitalise them, index them. This service is provided by a number of commercial website companies, but of course, they have paid subscriptions. I guess that if I was to start genealogy afresh, that I might be tempted to invest in an annual subscription with one of those companies. If I didn't live in the country of my ancestry, then even more so. As it is, I'm lucky, as the vast majority of my ancestry over the past three or four hundred years appears to be quite local, so that I can easily visit local archives and church yards. So how did I get on with my Free Internet Genealogy Experiment with great grandmother Emily Smith (nee Barber)? This is a story of three generations of rural working class families, in South Norfolk, and just over the border in NE Suffolk. On the 16th September, 1794, John Ellis married Elizabeth Beckett at the parish of Tasburgh in South Norfolk. They were G.G.G.G grandparents of myself. Tasburgh is a small village that straddles an old Roman road. The couple then settled in the neighbouring parish of Saxlingham-Nethergate. Their first two children, John, and Elizabeth, were baptised there. Sometime around 1796, they moved slightly to the south, to the parish of Hempnall, Norfolk. They settled there for may years, and Elizabeth gave birth to a further nine children by 1818, at Hempnall. One of those was my G.G.G grandfather, James Ellis, who was born on the 16th April 1812, and was baptised shortly after at the parish church of Hempnall. At least one of the baptisms recorded that the father, John Ellis, was employed as a labourer - as with most rural working class men, he was an agricultural labourer. G.G.G grandfather James Ellis, grew up to marry a woman named Esther. They eventually settled in Esther's parish of birth - a few miles to the east of Hempnall, in the village of Hedenham, Norfolk. However, at first, they may have spent some time even further east, in the village of Ditchingham, Norfolk. They first had two daughters, including my G.G grandmother, Maria Ellis, who was baptised at Hedenham on 29th September 1834. But in 1838, they had a son named Benjamin, who was baptised at nearby Ditchingham. All later children - six of them, between 1841 and 1850, were born at Hedenham again. During both the 1841 and 1851 censuses, the Ellis family were recorded as living in Hedenham. James was recorded as working as an agricultural labourer in 1851, as was his twelve year old son Benjamin. Now let's just step away from the Ellis family for a moment, and look at another ancestral family, the Barbers, living at this time, just over the county border to the south, in a little hamlet of South Elmham, named St Michaels. G.G.G grandparents Robert and Mary Ann Barber, were both born in the county of Suffolk sometime around 1794. They were raising a family in St Michaels, Suffolk. Between 1818, and 1841, I found records of at least eight of their children, all born in St Michaels, S.Elmham. One of them was my G.G grandfather George Barber, who was born in 1830. During the 1841 census, eleven year old George was living with his parents and siblings in St Michaels. Then something went wrong. Perhaps the father, Robert Barber, died. Perhaps they fell into extreme poverty, or even an illness struck the family. With very little welfare, such events were often a tragedy to 19th Century rural working class families. After 1841, the family disappear. I lose trace of Robert and Mary Ann Barber. Instead, in 1851, I find my twenty year old G.G grandfather, George Barber, is humiliated as an inmate of Shipmeadow Workhouse - the Union workhouse of the Wangford Poor Law Union. Meanwhile, his thirteen year old younger brother, and nine year old younger sister are recorded as lodging with the Wigg family household in St Michaels. Back over with the Ellis's, also in 1851, my G.G grandmother Maria Ellis was recorded as working as a live in servant in a household of the Buck family in Hedenham, Norfolk. Seven years later, in 1858, George Barber married Maria Ellis, somewhere in the Wangford district of Suffolk. G.G Grandparents George and Maria Barber (nee Ellis) settled in the brides home parish of Hedenham, Norfolk, where between 1858 and 1868, they reared four daughters, including my great grandmother Emily Barber, who was born at Hedenham in 1859. George's occupation was recorded again, as agricultural labourer. During the 1861 census, the family are living at Old Gravel Pit, in Woodton, Norfolk - close to Hedenham. Emily was aged one. During the 1871 census, Emily, age now eleven, had a recorded occupation - Crow Keeper, which I understand to mean that she earned money for scaring birds from the fields. However, by 1881, Emily had left her family, and had moved to the City. She was now recorded as living at The Chantry, St Stephens, Norwich where she worked as a domestic servant for a John Rayner (a solicitor's clerk), and his family. Emily most likely met my great grandfather Frederick Smith in Norwich, where they married sometime between 1881 and 1884, and proceeded to raise their own family, including my paternal grandmother, Doris Smith. So how did I piece that together from free online research? I added three generations to Emily's line, and extended that section of my ancestry fan chart without even leaving home, or paying a penny. I made a story, I found probable tragedy, encountered some large families, identified their class, added new locations to my ancestry, such as Tasburgh - and even my first ever discovered ancestors from over the county border into Suffolk. I found that my great grandmother (I'll borrow a photograph to scan later) Emily Smith, earned money as a girl, working as a Crow Keeper! The main source was Family Search, the genealogical website hosted by the Church of the Latter Day Saints. This is a cracking free website. On it I could find and search a database of UK censuses from between 1841 and 1911. This enabled me for example, to locate a few ancestors locations when otherwise they would have been missing. The website also has an impressive database of transcribed parish registers and Bishops transcripts. In some cases, the original documents were also available as digitilised images. The search facility for all of their documents took a little getting use to, in order to get the best out of it, but what a free service! Another useful website was FreeBMD. This database was critical in tracing and confirming the marriage of George Barber to Maria Ellis in 1858. Although it only gives access to the indexes of state birth, marriages, and deaths, that along with correlations through the search facility of FamilySearch.org gave me enough information for that event. Finally, in a search like this - you have to use Google Maps, in order to get a picture of where your ancestors lived, use Street View to see them, and the maps to see exactly where the parishes are in relation to each other.